As I tried to fall asleep last night, having eaten soup and drunk fluids, my heart was beating hard and fast. I finally took some Lorazepam and drifted off. At 5 am, Scott was on his way to work. He’d asked if he could drop me and the kart somewhere to make my trip easier—he knew I wasn’t in good shape. My plan now was to recuperate, regroup, and try again Monday morning, knowing it would be cooling off. Several hours later as I drifted in and out of sleep, I heard a knock on the door. I called, “Come in!” The door opened and a woman’s voice asked, “Dr. Schoen?” What the hell! In came Deanna, a long-time patient, friend, and the designer of our Ketubah, and her spouse, Walter, a retired psychiatrist. “Deanna! What are you doing here?” She explained that she and Walter were following me online and decided I needed help. So they’d driven hours from their home in Dana Point (and cleverly located Scott’s Jayco trailer) to assist me. Deanna had a cooler in the car, and since there wasn’t much room for us all in the trailer, we went out to their rented SUV to eat. They’d brought me a tuna sub from Subway, fresh fruit, nuts, cookies, salads, water, juice and Gatorade. As we sat there, I ate hungrily, and we talked. Deanna and Walter offered to drive me anywhere I wanted to go. It was decision-time. Once I accepted a ride, I would no longer consider the walk “pure,” and this bothered me. I asked them to wait while I went back to the trailer and made some calls. I called a few of my mentors as well as my wife. Their assessment—as well as mine—was this: the desert was going to kill me, and had already started to do a good job of it. Scott came by at some point and agreed. The decision was made. Scott helped me lift Walker into the SUV and we said our goodbyes. The outside temp: 107°. 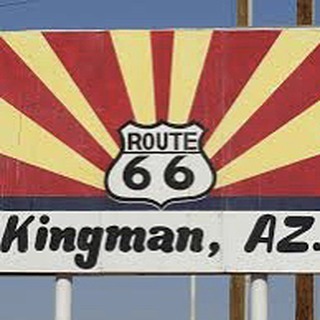 The heck with Needles or Laughlin; we drove straight to Kingman, Arizona. In the car, I called ahead and made a reservation at Motel 6 for 2 nights. When we arrived, I checked in, put my stuff in the room, and we headed to Mattina’s, a nearby Italian restaurant. Dinner was my treat, but how could I ever repay this incredible gift? Alone in my motel room after Deanna and Walter left, I thought about the future. Monday morning I would resume my journey from Kingman. For anyone tracking my progress who might be disappointed in not being able to follow my walk another 100 miles of desert, I truly apologize. My own hope is that I can make it the rest of the way.